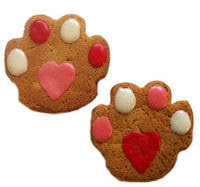 All Things Dog Blog All Things Dog Blog: Valentine Treats for Your Pup! Valentine Treats for Your Pup! Is Fido salivating while he waits on you to deliver his Valentine yummy? Here's your ticket. Pawsitively Homemade will deliver assorted Valentine Treat Packages to 6 of our winners. No mushy cards required; one sniff will do the trick and your pup will be ready to Sit, Stay, Snack! Want to learn more about this small U.S. bakery? Check out my review and visit their social media sites. You'll love the assortment at their website, including gluten free and other special needs choices. Entering is super easy with our Rafflecopter form at the bottom of the post. If you don't see it, it may be napping. You can wake it up by refreshing the page; just click on the post title and it will rise and be at your service. Entries will be accepted through February 13, with winners to be announced on Valentines Day, February 14. You can select those entries you wish to participate in. All entries are not required. It's sort of like choosing your own adventure. Each entry will offer you the opportunity to learn more about Pawsitively Homemade or All Things Dog Blog and our other ventures. Join the fun and good luck to you! Sissy would like to try the peanut butter or the peanut butter chip. She loves anything with peanut butter. My dogs would like all of these! But I think they'd like the peanut butter chip or the sweet potato ones the best. I think Jackson would like to try the Banana Coconut flavor. I like the Scottie dogs the best, but I think the pups would like peanut butter. My dogs are both peanut butter fanatics so that would be the flavor I'd choose. My dogs love anything with sweet potato. My dog would love the banana treats. Bentley would devour them all, but I've noticed lately that he does have a thing for peanut butter. I think the peanut butter would go over big here. Bru would love to try the banana coconut -- he's never had those flavors before! Peanut Butter Honey + Bacon! The dogs would love to try the Peanut Butter Delites! I think I would get the Everyday Specialty Dog Paws for my dogs. Thanks! Bullet would love peanut butter!